Love the beach? Don't miss this chance to own a beautifully furnished ocean-front condo with all of the amenities you could ask for! This home has been recently upgraded with new wood-look laminate flooring throughout, heating/cooling system/granite kitchen counter-tops and ceiling fans. When you step into your new beachfront condo you will see a beautiful, modern kitchen with plentiful counter space and white cabinets. The dining area features a stained glass light above the expandable, bar-height table that is the perfect level for watching the ocean. Relax on the couches in the main living area or take your morning coffee or evening beverage onto the oversized balcony and look for dolphins at play in the Atlantic ocean. The balcony also has screened, sliding glass doors and is accessible through the living room and the master bedroom. The master bedroom features an adjustable king-sized bed and en suite bathroom. The bathroom includes double sink vanity, large tub and glass walled shower. This beauty is located in the heart of North Myrtle Beach in the popular Ashworth community and is just a short walk to all of the entertainment this area has to offer. Bring your friends and family and enjoy the building amenities that include indoor / outdoor pools, large hot tub, kiddie pool, lazy river, spacious sun deck, exercise room and pet walking area. The private sidewalk leads to the deck for access to the beautiful sandy beach. 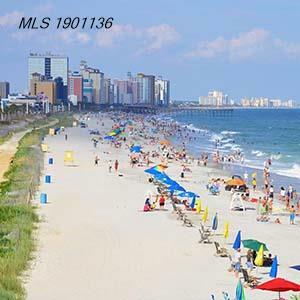 Call now to see this beach home and get ready to enjoy the laid back lifestyle of North Myrtle Beach!